Ghaznī (Pashto: غزني‎, Persian: غزنی‎‎) or Ghaznai (غزنی), also historically known as Ghaznīn (غزنين) or Ghazna (غزنه), is a city in Afghanistan with a population of nearly 150,000 people. It is located in the central-east part of the country. Situated on a plateau at 2,219 metres (7,280 ft) above sea level, the city serves as the capital of Ghazni Province. It is linked by a highway with Kandahar to the southwest, Kabul to the northeast, and Gardez and Khost to the east. The foundation stone of Ghazni Airport was laid in April 2012 which now serves Ghazni and other nearby eastern Afghan provinces. Similar to many other Afghanistani cities, Ghazni as ancient city has withstood numerous military invasions. During the pre-Islamic period, the area was inhabited by various tribes who practiced different religions including Buddhism and Hinduism. Arab Muslims introduced Islam to Ghazni in the 7th century; they were followed by the 9th century Islamic conquest of the Saffarids from Zarang in the west. Sabuktigin made Ghazni the capital of the Ghaznavid Empire in the 10th century. The city was destroyed by one of the Ghurid rulers, but later rebuilt. It fell to a number of regional powers, including the Timurids and the Delhi Sultanate, until it became part of the Hotaki dynasty, which was followed by the Durrani Empire or modern Afghanistan. 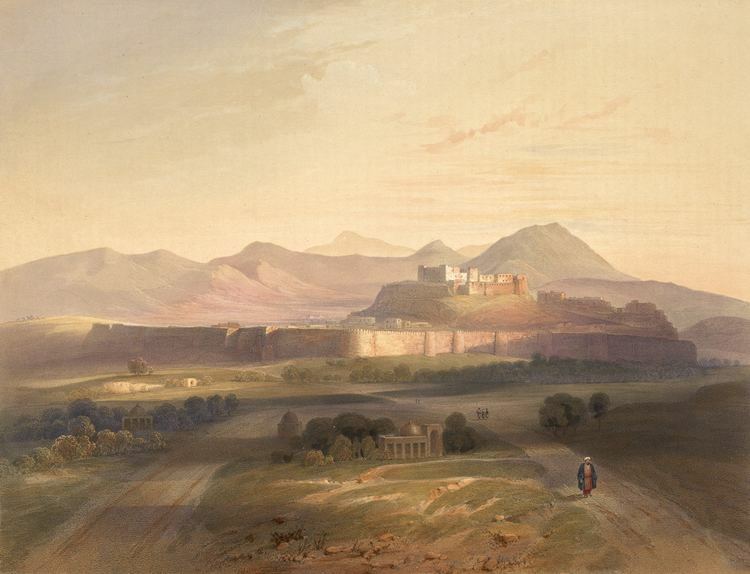 During the First Anglo-Afghan War in the 19th century, Ghazni was partially destroyed by British-Indian forces. The city is currently being rebuilt by the Government of Afghanistan in remembrance of the Ghaznavid and Timurid era when it served as a major center of Islamic civilisation. The Afghan National Security Forces (ANSF) have established bases and check-points to deal with the Taliban insurgency. Ghazni is a trading and transit hub in central Afghanistan. Agriculture is the dominant land use at 28%. In terms of built-up land area, vacant plots (33%) slightly outweigh residential area (31%). Districts 3 and 4 also have large institutional areas. The city of Ghazni has a population of 143,379 (2015) with 4 Police districts (nahia) and total land area of 3,330 hectares. There are 15,931 total number of dwellings in Ghazni city. The city was founded some time in antiquity as a small market town. It may be the Gazaca (Gázaca or Gāzaca) mentioned by Ptolemy, although he may have conflated it and Ganzak (also known as Gazaka), in Iran. In the 6th century BC, the city was conquered by the Achaemenid king Cyrus II and incorporated into the Persian empire. The city was subsequently incorporated into the empire of Alexander the Great in 329 BC, and called Alexandria in Opiana. By the 7th century AD, the area was a major centre of Buddhism. In 644 AD, the Chinese pilgrim Xuanzang visited a city named Jaguda – which was almost certainly the contemporary name of the later Ghazni – while while returning from Varnu (modern Bannu, Pakistan) – and as he crossed the land of a people he called O-po-kien (Afghans/Pashtuns). In 683 AD, Arab armies brought Islam to the region, but many refused to accept the new religion. Yaqub Saffari from Zaranj conquered the city in the late 9th century. It later became the dazzling capital of the Ghaznavid Empire, which encompassed much of northern India, Persia and Central Asia. Many iconoclastic campaigns were launched from Ghazni into India, resulting in the destruction of ancient temples, libraries and palaces. The Ghaznavids took Islam to India and returned with fabulous riches taken from Indian princes and temples. Although the city was sacked in 1151 by the Ghorid Ala'uddin, it soon became their secondary capital in 1173, and subsequently flourished once again. Between 1215 and 1221, Ghazni was ruled by the Khwarezmid Empire, during which time it was destroyed by the Mongol armies of Genghis Khan's son Ögedei Khan. In the first decades of the 11th century, Ghazni was the most important centre of Persian literature. This was the result of the cultural policy of the Sultan Mahmud (reigned 998–1030), who assembled a circle of scholars, philosophers, and poets around his throne in support of his claim to royal status in Iran. 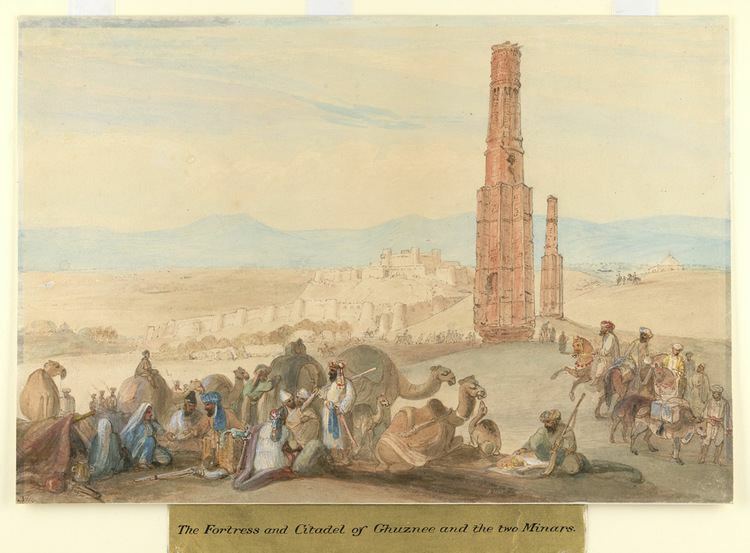 Ghazni City is famous for its minarets built on a stellar plan. They date from the middle of the twelfth century and are the surviving elements of the mosque of Bahramshah. Their sides are decorated with intricate geometric patterns. Some of the upper sections of the minarets have been damaged or destroyed. The most important mausoleum located in Ghazni City is that of Sultan Mahmud. Others include the Tombs of poets and scientists, such as the Tomb of Al Biruni. The only ruins in Old Ghazni retaining a semblance of architectural form are two towers, about 43 m (140 ft) high and 365 m (1,200 ft) apart. According to inscriptions, the towers were constructed by Mahmud of Ghazni and his son. 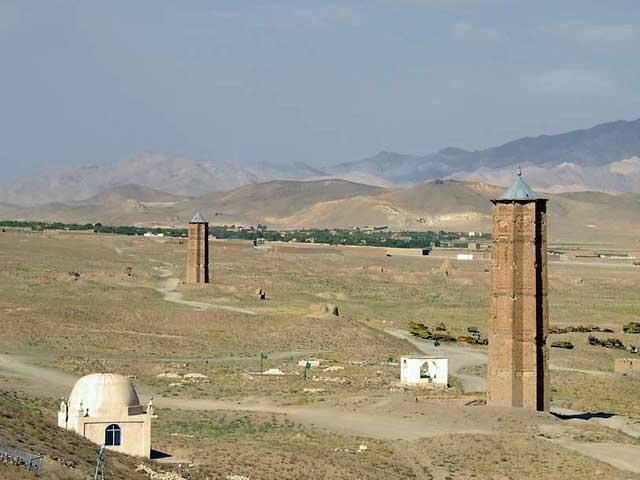 For more than eight centuries the “Towers of Victory” monuments to Afghanistan’s greatest empire have survived wars and invasions, the two toffee-colored minarets, adorned with terra-cotta tiles were raised in the early 12th century as monuments to the victories of the Afghan armies that built the empire. By the time the Ghurids had finalized the Ghaznavid removal from Ghazni, the city was a cultural center of the eastern Islamic world. The Buddhist site at Ghazni is known as Tapar Sardar and consists of a stupa on a hilltop, surrounded by a row of smaller stupas. Nearby, an 18-metre (59 ft) long Parinirvana (reclining) Buddha was excavated in the late 'sixties and early 'seventies. It is believed to have been built in the 8th Century AD as part of a monastery complex. In the 1980s, a mud brick shelter was created to protect the sculpture, but the wood supports were stolen for firewood and the shelter partially collapsed. In 2001, the Taliban blew the Buddha up, believing it to be idolatrous. During the First Anglo-Afghan War, the city was stormed and taken over by the British forces on July 23, 1839 in the Battle of Ghazni. The Civil war in Afghanistan and the continued conflict between the Taliban and the Northern Alliance during the 1990s put the relics of Ghazni in jeopardy. Ghazni's strategic position, both economically and militarily, assured its revival, albeit without its dazzling former grandeur. Through the centuries the city has figured prominently as the all-important key to the possession of Kabul. After the 2001 invasion of Afghanistan, the United States armed forces built a base in Ghazni. They have been involved in rebuilding projects and protecting the local population against Taliban insurgents. In the meantime, they are also training the Afghan Local Police (ALP) Afghan National Police (ANP) and Afghan National Army (ANA). In 2010, the United States established the Lincoln Learning Center in Ghazni. The Lincoln learning centers in Afghanistan serve as programming platforms offering English language classes, library facilities, programming venues, Internet connectivity, educational and other counseling services. A goal of the program is to reach at least 4,000 Afghan citizens per month per location. Ghazni's climate is transitional between cold semi-arid climate (Köppen climate classification BSk) and warm-summer humid continental climate (Dsa). It has cold, snowy winters and warm, dry summers. Precipitation is low and mostly falls in winter (when it mostly falls as snow) and spring. The population of Ghazni is around 157,600. It is a multi-ethnic society, with approximately 50% being Tajik, 25% Hazara, and 25% Pashtun. There may also be small number of Sikhs and Hindus. In April 2012, Ghazni Governor Musa Khan Akbarzada laid the foundation stone of the Ghazni Airport. The city sits next to Afghanistan's main highway that runs between Kabul and Kandahar in the south. There are roads leading to Gardez and in the east and other nearby villages as well as to towns in Hazarajat in the northwest. The city has a number of public schools. Jahan Maleeka School is an all-girls school with over 5,000 students and 150 teachers. Naswan Shaher Kohna School, another all-girls school, has over 3000 students. In May 2010, the U.S. government established the Lincoln Learning Center which, like U.S. public libraries, provides free access to information about the United States via multimedia, book collections, the Internet and programming for the general public. Ghazni City is in an area of extreme drought. In 2007, one of the gates on a 50-year-old dam on the Jikhai River broke, bringing up concerns among the inhabitants of Ghazni city about the water supply. The dam serves as a good source of irrigation water to Ghazni City and the surrounding agricultural areas. Nearby rivers have a history of flooding and causing severe damage and death, though efforts have begun to remedy this.